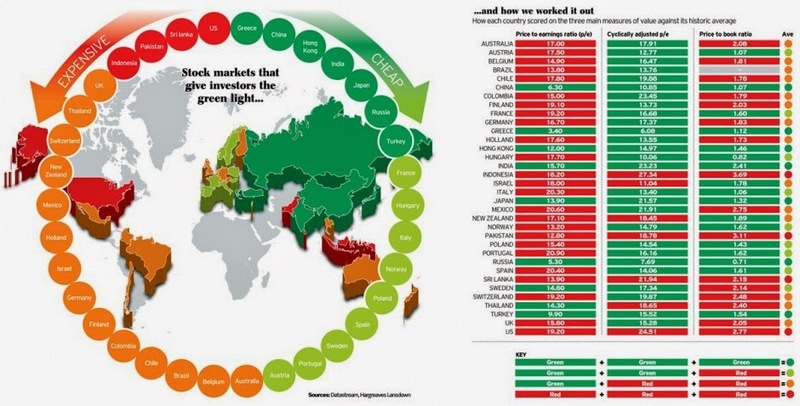 The chart below from The Telegraph is a great visual showing the most to least expensive stock markets around the world. Last week we reviewed global stock markets using exclusively the CAPE price to earnings ratio in How The Home Bias Phenomenon Impacts Investors. The value indicator below uses the CAPE price to earnings ratio along with two other metrics; standard price to earnings ratios and price to book ratios (the price of a company in relation to its underlying assets). The study found that the four most expensive markets in the world are Indonesia, Pakistan, Sri Lanka and the United States (the most overpriced market in the world). The four least expensive markets are Greece, China, Hong Kong and India. While both countries face different short term challenges, I believe any short term pull backs in the Chinese and Indian stock markets represent tremendous long term buying opportunities. Click for larger image below. Full article here.